Dr. David A. Anderson Podiatrist in Bridgeport, WV and Weston, WV is an innovative podiatry physician and surgeon. We provide exceptional podiatric services to a 6 county area in North Central, WV. We have 2 convenient office locations to provide complete foot care services to Barbour, Harrison, Lewis, Marion, Taylor, and Upshur Counties. 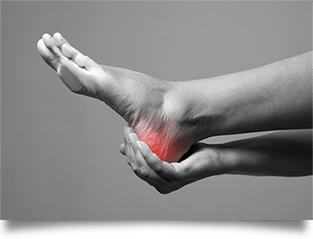 Our experienced and friendly staff is ready to provide services for a multitude of foot and ankle problems. We specialize in providing podiatric care for the entire family. If you are experiencing pain associated with your feet or ankles, or someone in your family is in need of exceptional podiatric services give us a call to request an appointment. We have over 20 years of experience in providing services that can ease your pain, and get you started on a path of increased mobility. We strive to provide the very best podiatry services to members of our community and surrounding areas. If you are looking for an experienced hometown doctor to help you get back on your feet, Dr. Anderson is available to help you. Call or contact our Bridgeport, WV or Weston, WV office for more information. We are the only area provider offering Laser therapy. Laser therapy treatments have shown to be effective treatment for toenail fungus infections, plantar warts, and varicose or spidery veins. We are pleased to offer specialty laser treatment services to our patients. Call or contact our Bridgeport, WV or Weston, WV office to schedule an appointment with our laser specialist. Most major insurance plans are accepted. We participate in the Diabetic Shoe Program. Call us for more information. Laser treatment is very effective, and our particular laser machine has been FDA-approved specifically for toenail fungus. Dr. David A. Anderson Podiatrist provides foot care service to include laser treatment, in-office X-rays, and prescription medication when needed. Dr. Anderson can diagnose and treat all foot care problems, such as planter fasciitis, bunions, ingrown toenails, and hammer toes. Dr. David A. Anderson Podiatrist treats patients in Bridgeport, Weston, and Grafton, West Virginia. © 2019 | Dr. David A. Anderson Podiatrist.